I just wanted to say that your chairs are hard. It's so nice, because it makes sure you don't sit there too long. Those chairs they have at Westford let you sink in and before you know it you've wasted your whole day in front of the computer. So good on the J. V. Fletcher Library in Westford, MA, for having comfortable chairs. And maybe good on us for not? Thanks Chris - keep them coming. Librarians can spend so much time thinking about how to run a library that we forget that we're also patrons, and get to use the library, too. At least, I did. I mean, I read a lot of library books, and also watch a lot of our DVDs. Popular materials are a valuable core library offering, but my own personal entertainment doesn't feel like it should count as library use. So I was happy that I was able to use the library for a bit of research and practical knowledge (and just a little bit embarrassed that using the library wasn't my own idea). 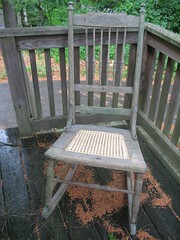 A friend of mine gave me an old wooden rocking chair a few years ago, which was in pretty rough shape. I'd always meant to fix it up, but doing it right would have entailed recaning the seat. I'd put it off and put it off, but a few weeks ago I finally got around to starting the project. Since I had to buy some caning supplies, and hopefully learn how to do it, I went to a chair store that did this kind of work. While talking to the guy there, he suggested I use The Complete Guide to Chair Caning as a guide. He went on to suggest that, instead of buying it, I should try to get it from the library - and then he asked if I ever go to the library. That led to a nice little discussion about the benefit of libraries, but it also left me feeling a little sheepish that I hadn't already checked to see if my library had something that would help me with this project. The next day I searched our catalog, and ended up requesting the book from another library in our consortium. After consulting the book, and a few days of work, I was able to fix up the chair's seat, good as new (check out my progress). For whatever reason, getting this book from the library and finishing this project is such a more rewarding and positive library experience than DVDs or audio books. I don't mean to detract at all from popular materials, and perhaps I'm kind of biased being a reference librarian, but hooray for non-fiction. I'd forgotten how good it feels to be a library patron.